FA Cup matches will be shown live on the BBC until 2025 as part of a new four-year broadcast deal with the Football Association. The new agreement - which starts at the beginning of the 2021-22 season - will see BBC Sport continue to show live fixtures, highlights and online clips. Up to 18 fixtures a season will be televised - more than ever before. The FA said the deal was "exciting", adding: "We look forward to working with the BBC for years to come." Mark Bullingham, the FA's chief commercial and football development officer, said Manchester United's fifth-round win at Chelsea was the most-watched domestic match of the season, with an audience of 8.1 million people. "The popularity of the competition goes from strength to strength and continues to draw some of the largest audiences in sport," he added. The new deal will also see greater coverage of the competition's early stages, with up to six live matches from across the first and second rounds. 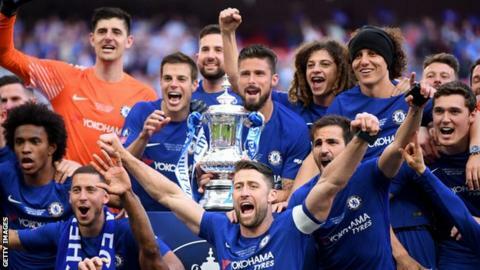 Barbara Slater, director of BBC Sport, said: "We are delighted to have secured these FA Cup rights until the 2024-25 season, ensuring the millions that tune into free-to-air TV can continue to enjoy the most famous domestic cup competition in the world. This season's competition continues on the weekend of 6-7 April, with Manchester City taking on Brighton, live on BBC One, and Watford facing Wolves in the semi-finals.